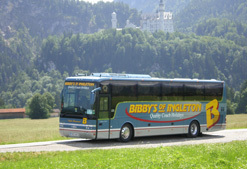 is a family run coach operator based here in Ingleton. We have been established for over 50 years and have an extensive summer and winter tour programme, and also provide coaches for private hire and school contracts. We are a well-organised family owned and run company and pride ourselves on providing a personal service with attention to detail together with meticulous planning and high standards.